BIG 2015 UPDATE: I was part of an underwater video crew that helped document whale shark tourism practices in Oslob and Donsol. You can watch the trailer below. It is titled ‘On the Brink’ and will be shown next year (2016). MAJOR DEVELOPMENT: DENR has ordered that whale shark feeding be stopped in Oslob. DENR-Protected Areas and Wildlife Bureau Director Theresa Mundita S. Lim gave the directive in a letter to the DENR regional executive director. EDIT: There is a similar practice with swimming with whale sharks in the island of Leyte and it seems to be more sustainable. 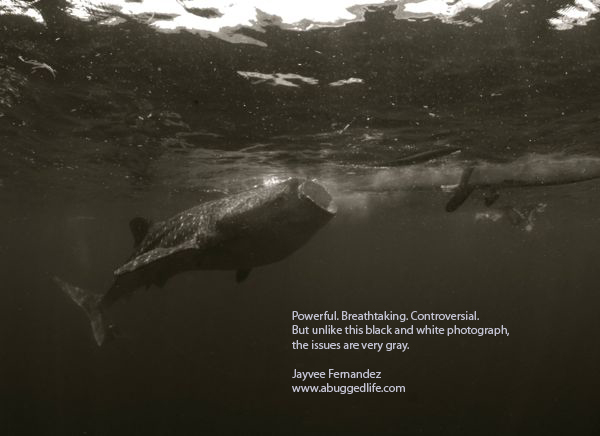 I promised myself that I would write about the controversy behind the whale sharks of Oslob on the condition that I see the phenomenon myself. Being there, seeing it — it contributes to being informed. Frankly I’m tired of “armchair activists” who pile on issues like this — making sweeping generalizations about what’s best for these fish yet are so far away removed from the situation while they drink their lattes and sport clothes that apparently have buttons made out of poached Philippine shells. All oblivious. That being said, I’d like to give a huge shout out in support of the advocates, scientists and ecologists who are bringing this matter to the public eye. AA Yaptinchay, AG Sano, Lory Tan, Anna Oposa .. and many more. Rocked founder Gang Badoy once said that nation building is all about conversation and this is such a matter that needs a lot of it. I don’t classify myself as a conservationist per se, but I have always loved nature since I was a child and my fascination for marine life fuels this hobby of underwater photography and SCUBA. I am in the Philippines after all, one of the capitals for this sport. There is a lot of controversy behind the whale shark feeding practices for tourism in the little town of Oslob in Cebu. It promotes bizarre (yet fascinating) behavior of these giants, but at the same time pushes fishermen to be more concerned about the welfare of these creatures (whereas before they were considered pests and were driven away violently). In this post I will enumerate the arguments FOR and AGAINST this form of tourism and end with my personal thoughts on the matter. I will also cite the sources for some of these arguments in hopes that a conversation can bring about real change with hopefully, a win-win situation. Before proceeding, you may want to read through three articles: (1) this is a piece written for Dive Photo Guide by my friend Steve de Neef who is a professional UW videographer and photographer. He exposes some of the origins of the whale shark feeding and grassroots discussions with some of the fishermen. The second piece is an (2) appeal from many concerned citizens on the whale shark feeding practice to the DOA and the DENR. 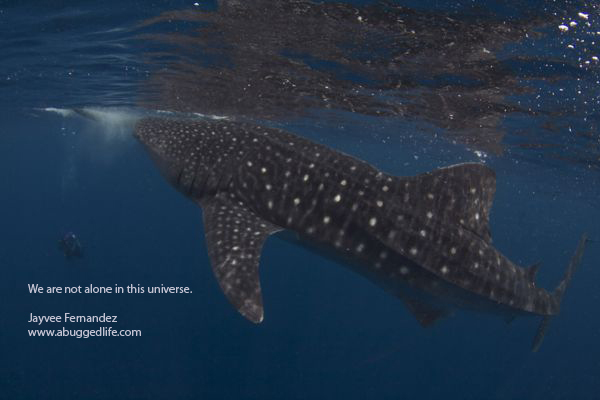 I also highly suggest you “Like” the Marine Wildlife Watch Facebook page and the Oslob Whale Shark Watching page. Lastly, this article on Inquirer talks about the laws involved and the “viral” photo that went around during a similar controversy. For the record, I have seen 7 whale sharks in my entire life: 2 while snorkeling in Donsol, 4 in Oslob and one in the actual blue wilderness of Moalboal in Cebu. I will say to you now that nothing beats a whale shark encounter in the “wild” and by that I mean not being fed by fishermen of Oslob nor being chased by the propeller boats of Donsol. That one encounter (with video) at 80 ft deep while absorbing the sardine run and it was by far the most amazing experience of my life on this planet. To document that moment is rare. I dove into the waters of Oslob with an open mind, following all the rules set by the program. I brought along a wide angle dome port with a 10-17mm fisheye Tokina lens which was perfect for shooting the world’s largest fish (The biggest one we saw was about the size of a commuter bus in length). The rules say that photographers are NOT to use flash, so I relied on natural lighting to photograph the whale sharks. In addition to this the rules say no touching, don’t get too close, and don’t get in their way — and I complied with all three. I must say the third is the hardest to accomplish as the juvenile whale shark of the bunch has been reported to play with the divers. It tried to sneak up behind me to playfully poke my tank, a practice that has been documented by the fishermen and is apparently common to younger whale sharks. For SCUBA divers, the maximum dive time is limited to 60 minutes or when your air runs out (whichever comes first). If you’re a diver, you’ll know that at a depth between 0-30 ft, 3000 psi of air will last you more than 90 minutes if you’re experienced. I spent a little more than 20 minutes underwater before surfacing with a lot of air left. That was all the time I needed as my average depth was really between 0-10 ft and the rocking waves were making me dizzy. It is not natural for whale sharks to be fed. The “spoiling” of these whale sharks tend to change their natural behavior and now chase after boats expecting to be fed. This can be fatal for the fish if the boats are propeller powered as the blades injure the shark. 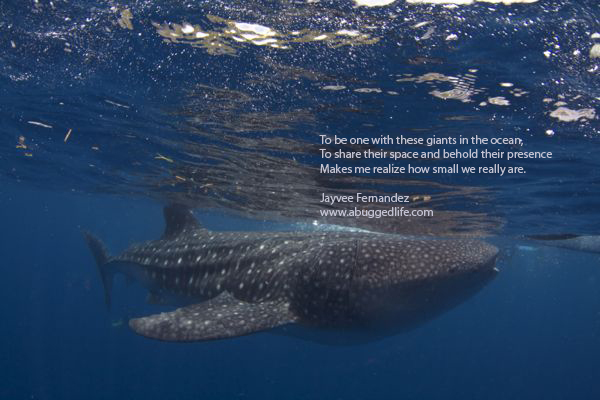 Close contact with whale sharks (i.e. touching) may seem harmless and innocent but these marine creatures have a protective coating that shields them from bacteria and disease. Touching them irritates this coating and can bring about infection. 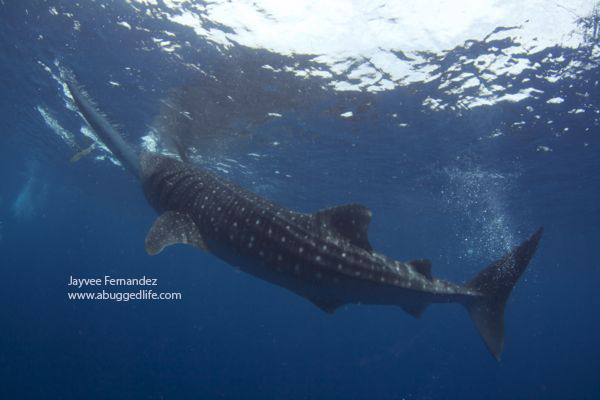 I personally witnessed one fisherman push the whale shark away from the boat with his foot planted on the fish’s mouth. Not that the fish didn’t mind, but it looked like this was one of the reasons why the mouths of these sharks are getting damaged. It’s not just because of the boats. Before this form of tourism was organized, the fishermen would harm the whale sharks because they would compete for catch. Throwing rocks into the open mouths and stabbing them were common practices. At least now, they have stopped harming the sharks in that way. The boat propeller accident is believed to be an isolated case and the community has acted upon it by cordoning off the area not allowing propeller boats inside. Although of course, this does not stop the behavior of the whale sharks from approaching other vessels outside the feeding zone. Perhaps the day for “no more propeller boats” is nigh? I have heard on-site reports from dive operators that the fishermen have organized into a co-op and are now making around PHP 20,000 to PHP 30,000 a month (each). That’s golden if you live in the province. As of this writing, the fees for whale shark watching are PHP 500 for SCUBA divers and PHP 400 for snorkelers. It’s higher if you’re a foreigner. There seems to be a push to increase the fees to make the experience “less accessible” to lessen the volume of snorkelers. As to whether this practice is good for conservation or merely a way to milk the “industry”, I’m unsure. 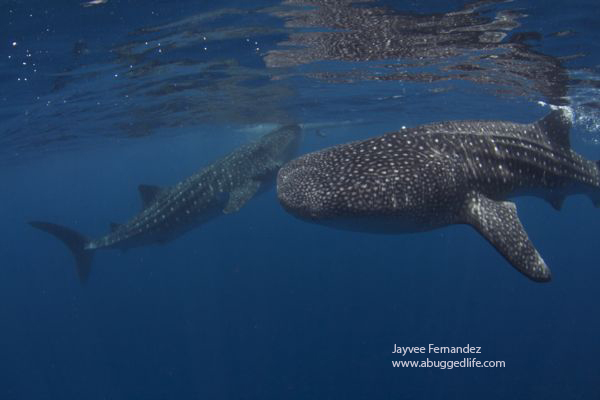 There is NO guarantee that these whale sharks will be protected outside Oslob anyway (since they are migratory by nature). Whatever the risks of feeding, at least they are alive when in the confines of this area. Very little is known about whale sharks — from reproduction patterns to other habits. In fact it was only recently that the smallest whale shark was found in the Philippines. This phenomenon allows scientists to experience the fish up close. The actual “feeding” may actually be part of whale shark behavior after all as these are friendly and playful creatures. The krill which is fed to the whale sharks doesn’t change the habits completely. Remember that whale sharks eat about 400kg of food every other day and if you compare that to what the fishermen give, that’s barely a snack. The feeding habits are not widely altered. Should word travel fast (and it does), seaside communities will progress to having a symbiotic relationship with these fish and not hunt them down for their meat. One thing is certain — if it is one thing we lack, it is the discipline to keep this sustainable. The sardine run in Moalboal has been fished out (and so have the thresher sharks) due to greed and ignorance (sadly, we can’t blame them!) and although the whale sharks aren’t being harmed like before, the fishermen need to seriously be trained further. To them, they’ve struck gold overnight and you can’t blame them for their excitement as anyone would strike on a chance to remove themselves from poverty. You would, right? More than laws, there really needs to be a grassroots effort to help this practice become sustainable in the long run. Education. Education. Education. As for the feeding.. well. How I wish whale sharks could talk. At least we’d know if they like what we’re feeding them. If you’re reading this and you’re a stakeholder, government official or an NGO that is somewhat involved, do let me know of updates and I will gladly post them here. Remember the “You Wouldn’t Steal a Car” Anti-Piracy ads? Turns out the ad is pirated. Excellent article, Jayvee. Glad to see how passionate you are about this. Keep it up! Let me know how I can help. Hmm. i hope you are not lumping inadvertently those who express concern over the feeding of whale sharks at Oslob as all “arm chair activists” a number of them are biologists, fisheries, ecologists and advocates. Who have spent more than latte time in this endeavor. During a talk about ecotourism at the University of the Philippines. More factors both ecological and social were mentioned. One was the carrying one of them was the concern over the impact of structures and the carrying capacity of the environment. 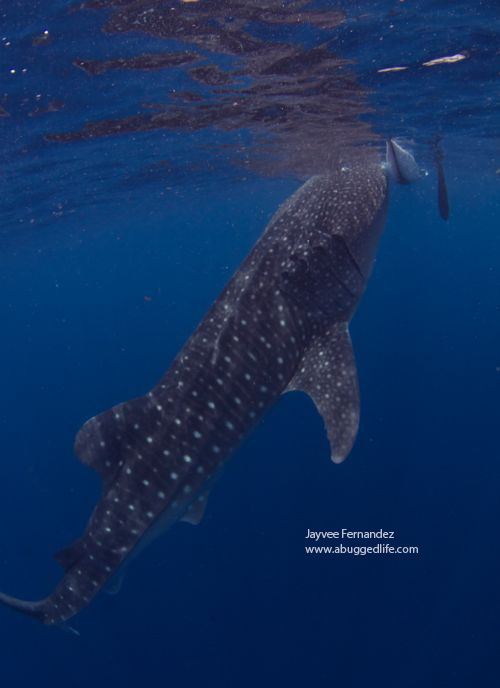 Another is the impact on the nature and behaviour of the feeding on the whale sharks, specially if these fishes do migrate from area to area. Ecology is the study of consequences. Hi Juned, Obviously not. I have deep respect for those who are involved in the research and advocate the protection and best practices for this. One of the pros you mentioned, the second bullet point, is not an argument in favor of feeding the whale sharks. Tell me, does it have to take more injured sharks for this to become a real issue? Doc Ale and his team have predicted that this would happen, and it did, and so do we have to wait for more of it to happen for the powers-that-be to take decisive action? Your 4th bullet point under the pros of feeding. There is no doubt that the folks in Oslob are keeping the sharks safe while in their territory. But the act of feeding has caused the sharks to be desensitized towards humans and human activities. That has been observed by researchers. And by me. 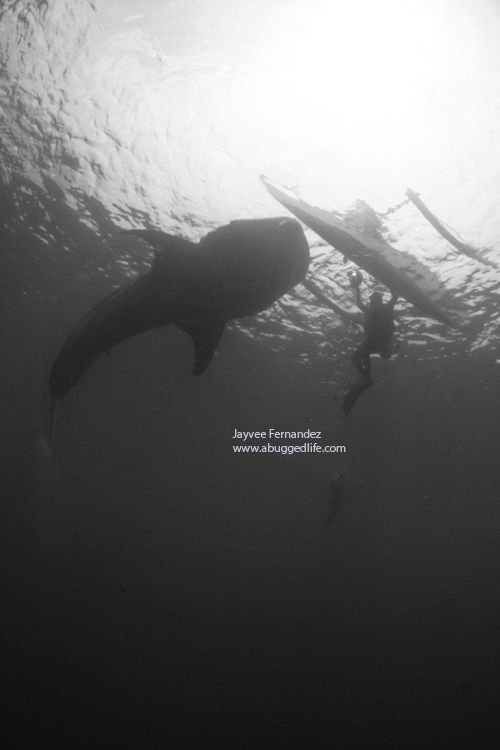 A whale shark approached our boat in Davao sometime ago and he was behaving like he was expecting to be fed. It was a good thing our boat’s propeller wasn’t running (but the engine was — which means they’re not afraid of the noise anymore). I’m sorry, my friend, but saying “Whatever the risks of feeding, at least they are alive when in the confines of this area.” is not a responsible thing to declare. These animals are migratory and do not care about human geopolitical boundaries. They do not know that they are only safe in Oslob. But they should be safe in their natural habitat, wherever that may be. You are right that education is urgently needed. And that’s what the LAMAVE team, Save Philippine Seas, Marine Wildlife Watch, among others, are trying to accomplish. Based on research, experts are saying that feeding the sharks is detrimental to this vulnerable species. Education will only work if we take it to heart. Thanks for chiming in. I get you. After writing this post, I did ask myself if I made a stand on the issue and since you brought that to light, my stand isn’t a solid one yet as although you know about my enthusiasm with the ocean, I don’t completely understand the issue and how it really impacts the community especially in the long run. Well it doesn’t end here my friend. I think posts like this are always a work in progress. It’s supposed to be October. But do you think holding the dive safari would be better in November? Actually October would be so much better. The reason for this is because my wife is giving birth early December and for precautions sake, I’d rather be close to home in November. Hey, congrats to you and the wife!! LET’S DO THIS! Keep me in the loop bro! I’m excited! Macro and wide? I choose not to have a particular stand on this matter and prefer to watch the issues being raised. My observations are that the more passionate are the conservationists and the environmentalists. They make their points loud and clear whenever they have any opportunity. However, we never hear the opinions, concerns of the fishermen and people who are directly benefiting from the increase in tourism. I really would like to hear more from them as they do not seem to have a voice other than through politicians which may or may not diminish their message. I try to remind myself that the more we know, the more we realize how little we know. Those who proclaim to know, probably know least. It is a big issue for sure. In Donsol whale shark watching, tourists ride in boats with propeller, that’s what makes it more harder to get closer to whale shark. There can be up to 10 boats = 60 pax to one whale shark with the spectacle being the people elbowing one another in the water as they race toward the whale shark. That’s the big difference between Donsol and Oslob whale shark watching. Yes but what about the feeding practices? Have you addressed them?